The wait is almost over– the Dime Novel Legends Kickstarter will be starting on October 1, 2016. The Old West. It was an era of untamed wilderness where law and order were administered as much by a revolver as by the badge. A time in which actions often spoke louder than words and when a man’s reputation carried as much weight as any credentials he could muster. It was a time of legends– often celebrated in radio, movies, televisions, and novels. 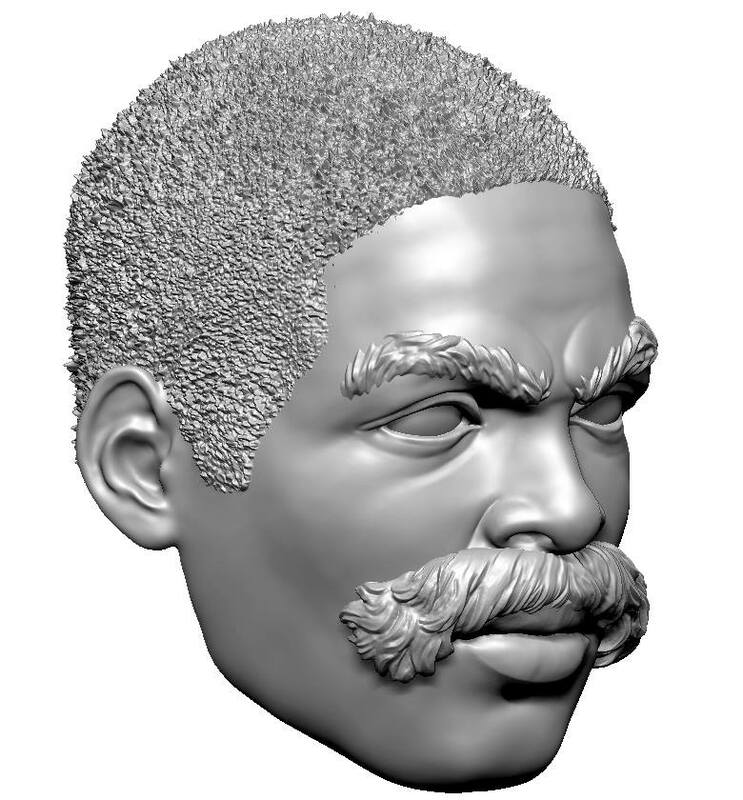 Soon, this period of frontier justice will beo be available as a series of 1:18 scale action figures that celebrates some of the most dynamic icons of this bygone era. Coming this October 1st from Chicken Fried Toys and Dime Novel Legends is the Kickstarter project you’ve been waiting for! 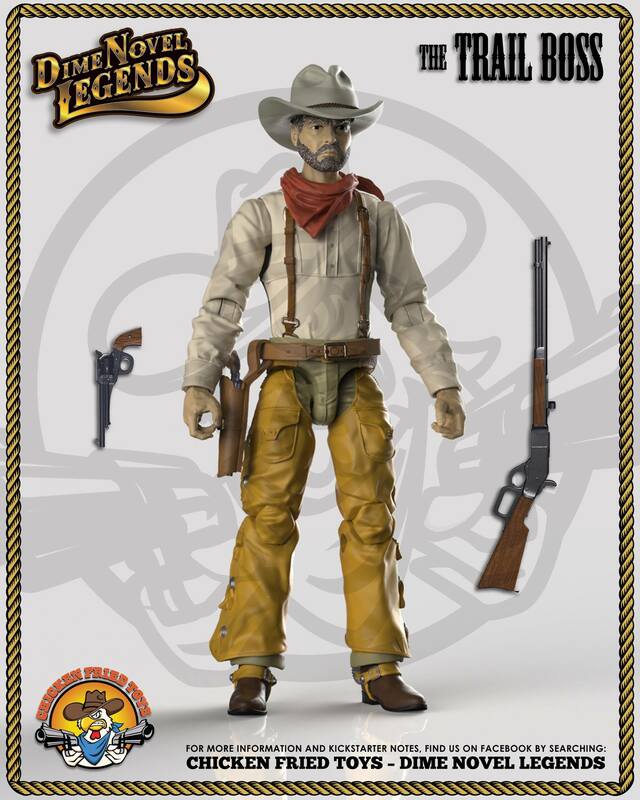 To this end, Chicken Fried ToysTM (CFT) is proud to introduce their Dime Novel LegendsTM (DNL), their first-ever lineup of 3.75-inch, fully articulated, collectible action figures that bring back the essence of the American Frontier West. These 15 realistic reproductions of iconic Western archetypes feature authentic styling and looks, and include numerous accessories and gear that historically reflect the period between 1835 and 1895. This line will be introduced via Kickstarter campaign on October 1, 2016 and will run for six (6) weeks. The Dime Novel LegendsTM lineup will encompass characters drawn from the rich history of Frontier America during its expansion westward. While easily identifiable, these characters do not represent any single person from history, film or literature. Rather, they are an amalgamation taken from the collective imaginations of enthusiasts who have long dreamed of accumulating an entire Western community of cowboys, townfolk, lawmen, bandits, and Native Americans from an often ignored and nigh-forgotten part of America’s unique and rich history. Chicken Fried ToysTM will introduce these iconic action figures intended for the adult collector featuring 16 points of articulation as part of a Kickstarter campaign beginning October 2016. 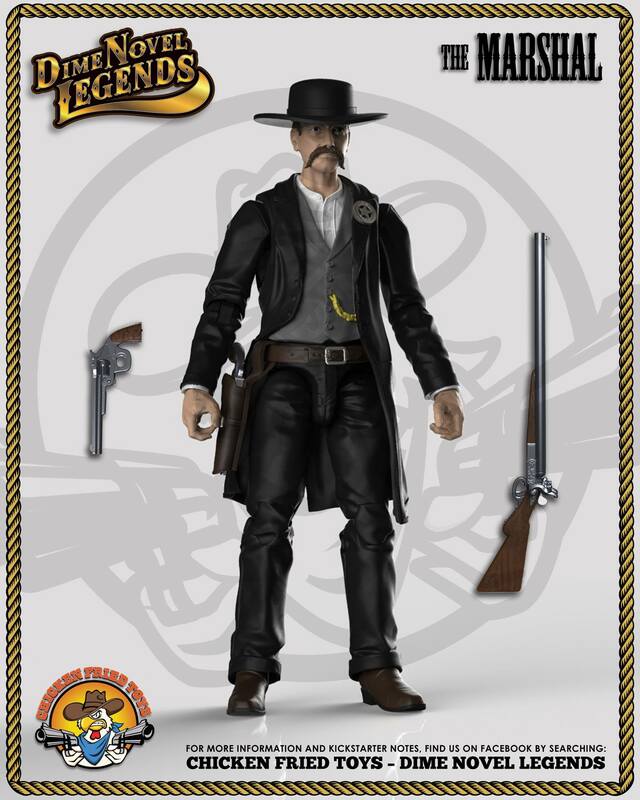 The Marshal – Clad in black, with his long coat pulled back over his working hoslter to show ruffians that he means business, this icon comes with a “Hogleg” pistol, “Street Howitzer” long gun, and removable hat and jacket. The Sheriff – Dressed like a “dandy” with a Derby and suitcoat, this lawman carries a cane, not so much for walking, but rather to give a sophisticated air to any cattle or mining camp he has been charged to protect. Territories Lawman – Before the regions of the American West became states, they were territories under the jurisdiction of the Federal government. 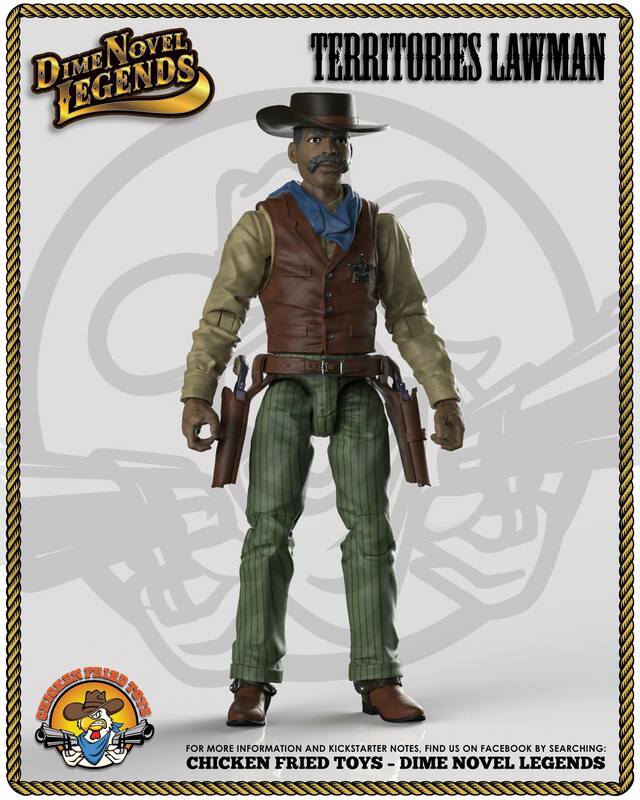 This storied African-American lawman comes with dual holsters and pistols, bandana, removable vest and hat. All this makes him the true definition of a Legend! Trail Boss – Wearing chaps and a broad-brimmed hat, this honcho of the trail drive has all the trappings of a seasoned leader. If his stern look doesn’t command the respect he’s earned, he has a lever-action rifle and removable “Outlaw” pistol to back it up. Saloon Bartender – No image of the classic Western town is complete without a bartender or shopkeeper. Likely the only person who can afford both moustache wax AND hair cream, often neutral in fights and always the center of information, this smiling gentleman with the apron is quick with a mug of refreshment, and a turn on the pickle/beer barrel. Sharpshooter – Wearing a period-correct bib-front shirt, this misplaced Texan sports a removable bandana, Texas-sized hat, cartridge belt with working knife and sheathe, and a legendary buffalo rifle with flip-up rear sight. Ranch Hand – No cattle drive is complete without the ubiquitous trail hand. His look is highlighted with tall Cavalry style boots, removable vest, and gun belt. His hat, surely bought fresh from the General Store with pay from working the latest cattle drive, tops his clean-cut look. Head Honcho – Every gang has its ringleader; a rough and tumble, but quick-witted character who is not to be trifled with on any occasion. He wears a removable vest, gun belt, bandana, and Derby. Gunfighter – The gang member with the cool temper and lightning quick six-guns is dressed in a suitcoat styled of the day. He has a removable hat, gun belt, twin holsters and pistols to fill ’em. Vaquero – This everyday inhabitant of the Texas Southwest has a wide-brimmed hat to keep the desert sun off his shoulders, along with chaps, gun belt, pistol and Spanish silver spurs. Dressed up brightly in his best for the celebratory rodeo at the end of a long cattle drive, he cuts quite a colorful character. Prospector – These men were some of the first brave souls to cross the Plains in search of riches and fortune, while “seein’ it all.” This old codger comes with an iconic hat and all the tools to hit the motherlode, including a pickaxe and pan. Fire Brigadier – When every town is made of either wood or canvas, a firefighter or two becomes an essential part of the landscape. This member of the Old West Fire Brigade comes with a Victorian-era fire helmet, red bib-front shirt, Halligan tool, fire axe and suspenders! Create Yer’ Own Outlaw – Clad in signature black and sporting a surly look, this villain will be named by Kickstarter participants in a poll run during the campaign. He will sport a long coat, Cavalry boots, double holsters for his gun belt, and two pitch-black pistols. 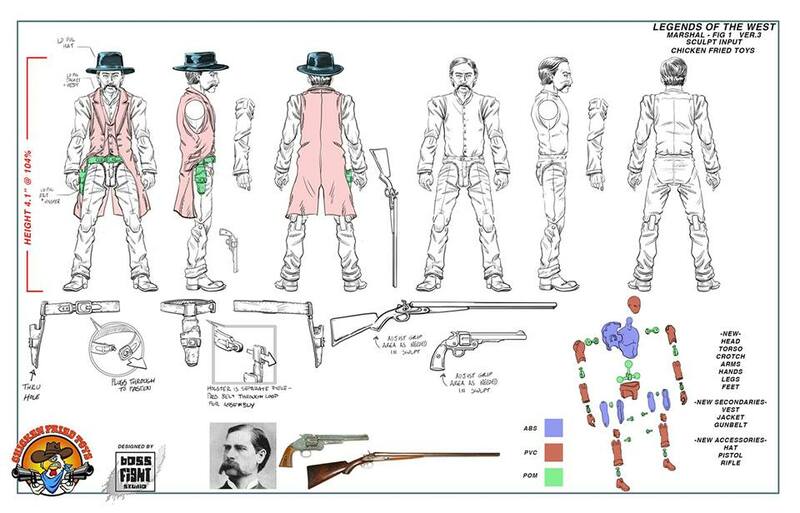 Create Yer’ Own Cowboy – Not just the name, but the color palette will be chosen by the “All-In!” Kickstarter pledges. This classically styled cowboy has chaps, unique hat, removable vest and all the right gear to complete your cattle drive! 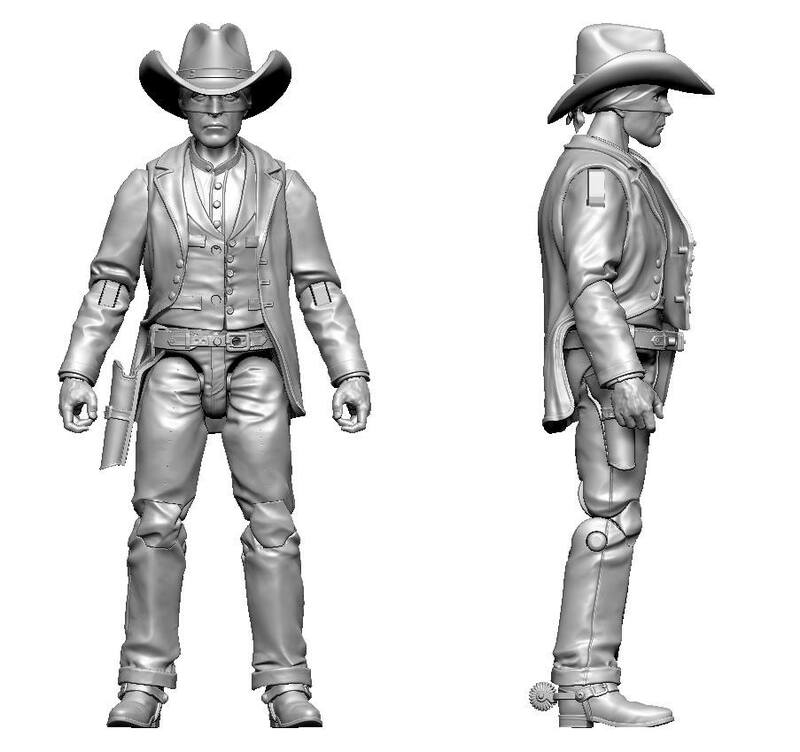 Badlands Vigilante – This 15th figure is exclusive to the “All-In!” Kickstarter package. 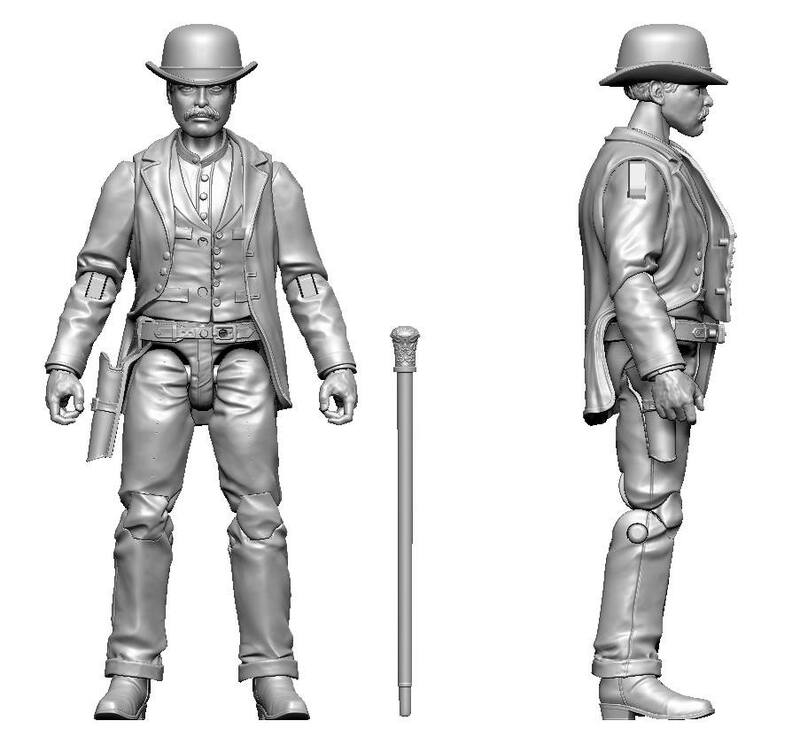 He has a unique portrait sculpt, removable “10-gallon” hat, bandana, suitcoat, gun belt, and shining silver six-guns. Gear Sets – Five sets comprised of different firearms, weapons, and gun belts in colors not available on any other figure during this initial offering. Accessory Sets – Five sets of jackets, vests, hats and bandanas in colors not available on any other figure during this initial offering. Buck-A-Roos!TM – Five “blank” figures each comprised of a single color shirt and sleeves, and different color britches with complementary colored boots. These colors will not be available on any other figure in the initial offering. Skin tones will vary from figure to figure for variety. 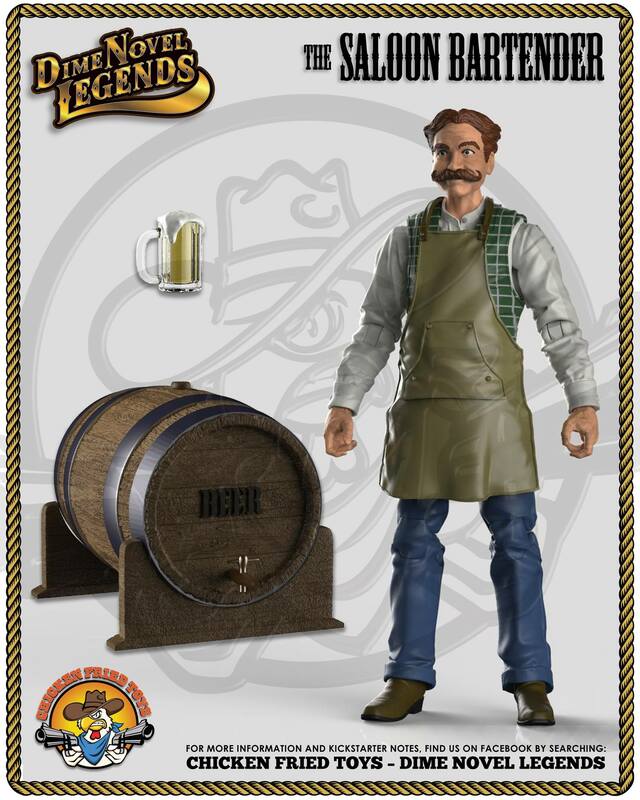 For more information, click our Chicken Fried Toystm – Dime Novel Legendstm Facebook page! Chicken Fried ToysTM is Paul Mundheim and JE Russell, lifelong action figure collecting enthusiasts. Working in partnership with lauded Boss Fight Studio and Smalljoes.com, CFT knows the unique mind of the 1:18th scale action figure collector like no other. Saddle up, and come along for the ride! What else do you need– a federal marshall to ride up and deliver you a written summons? 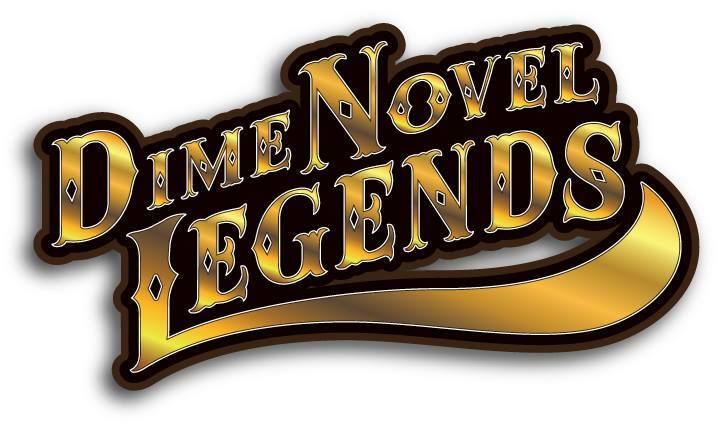 Seriously– mark October 1, 2016 on your calendars and get ready to support Dime Novel Legends!